The last time I hit up my local Habitat for Humanity ReStore, I think the thrifting gods were smiling down on me. Remember how I scored a set of vintage Readers Digest books? Well, I also scored two really sad little Parsons dining room chairs. Me: Babe! I found these amazing dining room chairs at ReStore today for only $5 each! David: Um. I know you probably have a vision, but they're black corduroy. And ripped. And ugly. Well of course I had a vision! And for $10, I thought it was worth a shot. I ran home and Googled "Parsons chair slipcovers." There were a ton of tutorials out there on how to make a slipcover, but ya'll know me and my complete lack thereof sewing skills, so that wasn't an option. I went back and forth between choosing a funky, colorful pattern and a simple, neutral cover. Most stores don't sell patterned Parsons chair slipcovers. I could have had one made from Etsy, but that was a) expensive and b) I decided to take the simple, neutral cover route. I don't want anything in that dining room trying to compete with my navy blue walls! So the hunt began. 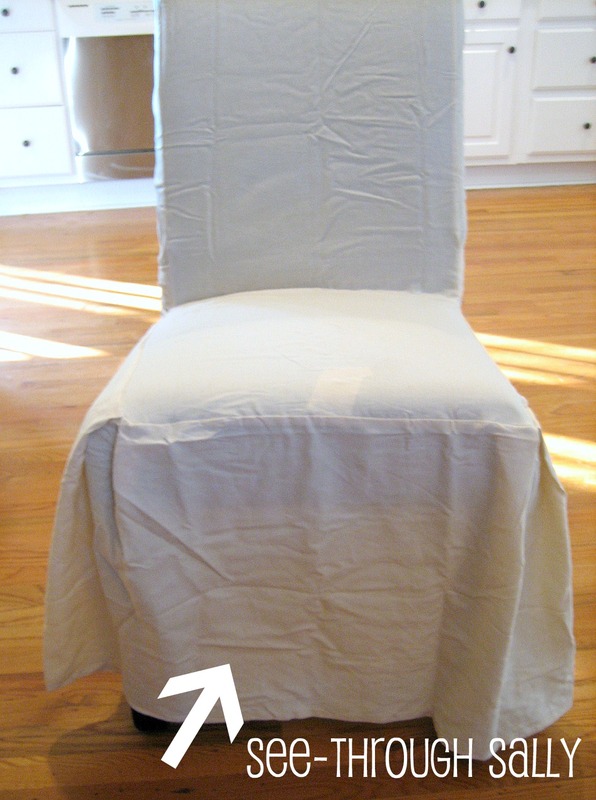 Many of the slipcovers were too small for the chairs I purchased, especially with the slight roll on the back of them. So I searched. And I searched. And I searched. Too big. Too small. Too short. It was definitely the Goldilocks syndrome. And then I hit the jackpot, in the form of... wait for it... KMart! Yup. Hello large, neutral, $13 (with shipping) slipcovers. I think I love you. Once they arrived on my doorstep from KMart.com, I immediately put the covers on the new chairs (which, by the way, I cleaned and Febrezed within an inch of their lives as soon as I got them home). Hm. Slight problem (besides the fact that they need to be ironed). These cheap little guys are kind of see through. My slipcovers need a slip! Here's where many of you would get creative and sew a slip or come up with some other fancy way to fix the see-through problem. Not me. I simply grabbed some old white curtains that were in my linen closet (note: they are very thin, almost linen-like material), wrapped one around each chair and pinned each up to my heart's satisfaction. Hey, I'm easy. TWSS. And it worked! Once I ironed them, the slipcovers went right over their slips and see-through Sally was no more! For a grand total of $18 a chair ($5 chair + $13 slipcover), I think I've done pretty good. Not sure what's going on with that glowing greenish light in my living room in this picture?! And yes, that is a house plant in the middle of my dining room table. Don't judge. Trust me, there ain't nothing green to bring in from my yard thanks to this scorching Georgia heat, so I have to work with what I've got. I still need to get some art on the walls in this room. You might have seen some options laying on the floor throughout the room- it's taking me awhile to decide what I want! And I'd really love to add a bench on one side of the dining room table to complete the piecemeal look that I'm going for with the table and chairs. Overall though, I think this room is really coming together. Especially when you consider that it looked like this for about a year of us living in the house! Have you thrifted anything fun lately? it looks lovely! i love the bigger head chairs, too mixed with the others. i have a set of 4 ladderback chairs very similar! Score! What a great find?? I love love love our Habitat store. And I love your idea for the "slip". Perfect! I love your "new" chairs! I am also challenged when it comes to sewing so I appreciate any tips I can get when it comes to DIY projects without having to sew!!! Love your new dining room look!!! Fabulous job! The slip idea was great and I love the mix of chairs at the table! It looks great!! Love what you did. Lovely!!! I've been wanting to get slipcovers to go on my Parsons chairs too - just for the end ones to mix it up as well. I'll have to check out KMart! Thanks for sharing. Love the chairs, they look great. I would have done the same thing, I have NO sewing abilities! They look great - so smart with the sheets! I lovity love slip covered dining chairs and you did a fantastic job!! IT looks so beautiful! I love the addition of the Parson chairs to the head of the table! LOVE those chairs! I especially love the vintage chairs. I just stumbled over here, and am SO glad I did! Love your blog and happy to be a new follower! I LOVE the navy and white as well as the mix of chairs! I also love how resourceful you were with the slip. Brilliant! It looks amazing, Michelle! Great job with the chairs too :) They look so perfect with your navy walls. Love love love! Nice job on making those work! They are perfect in your beautiful dining room. Your dining room is beautiful! What a bargain on the chair covers. I stopped by from Thrifty Decor Chick. Very glad I did, I am your newest follower! The dining room chairs looks great! Love it!